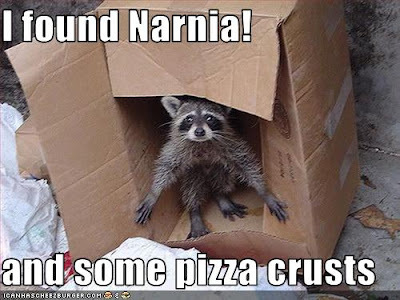 This one made me laugh today, so I figured I’d share with you (also, especially for my mom, who has a deep connection with raccoons…). I always save my LOL Cats for last on my Google Reader…saving the best for last, I suppose. As quickly as it began, my three day (that was supposed to be a camping trip) weekend is now over. I’ve been 25 hours with no hydrocodone…a little pain, but I’m going to wait until I go to bed to take another one so I can get used to not having it in my system. I’ve never had an “injury” this bad before, so I didn’t believe Joey when he told me how much better I’d feel after spending a weekend doing nothing. He was so right. Tomorrow will be back to the grind, though. I’m a little nervous, really, because I took things so slow this weekend…we just went to Wal Mart today and I had to take a 1.5 hour nap afterward. Tomorrow will be a full work day, and then knitting group at 6:30. Hopefully, I’ll be able to stay the whole time.